This Purgatory Townhouse is within walking distance to ski lifts, shopping and dining.Just 30 minutes from historic downtown Durango, Colorado. Year round activities just minutes away. The Retreat in The Mountains comfortably sleeps 4-6. Two queen beds in bedroom and a queen sleeper in the living room. 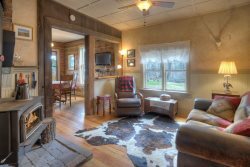 Wireless internet, cable TV and a wood burning fire place. Balconies with sliding door access from the dining room and the bedroom. Mountain views from both the dining room and the bedroom. The townhouse is located on the second floor and has a bedroom with 2 queen beds and a sleeper in the living room. One full bath with an additional vanity in the bedroom. The bedroom and dining room open to a balcony with views of west Needles mountains. Super nice and easy to reach! We loved the condo, it was in a great location with a beautiful view of the mountains. Very easy walk to the lifts and base area. Ample parking. Unit was the perfect size for 4. All appliances were in great shape. Was so nice to have good WiFi and cable! Every email I sent was promptly responded to. Thank you. Again, the property was completely fine for our purposes. I traveled with my teen aged boys without my husband, we just needed somewhere to sleep and close by the lifts. The price and comfort could not be beat! I do wish the furniture on the balconies was upgraded a bit to be more inviting to sit out side as our weather was stellar! The accomadations were very clean. We especially enjoyed the views from the balcony and the warm cozy fire. The kitchen was well stocked and ready to use. It may be nice to have a set of glass cookware to use for cooking in the oven, otherwise everything was satisfactory. The extra vanity in the bedroom space was very convenient. The living space was set up nicely with a full dining table and couch area providing a nice open space to relax as a family. Overall everything was very warm and inviting. We truly enjoyed our experience and would definitely consider renting here again. Great rental in great location. I think this is the third time I've rented with Vacation Accommodations of Durango and I'm always impressed. Well maintained in a perfect location. Stayed here with my two teenage kids and their two friends and we had a blast. Only had one issue unrelated to the actual condo and they took care of it immediately. Thanks Suzanne!!! It was an awesome place. Although questions were answered quickly and booking confirmation was quick, I did not receive any further instructions and had to email them 2 days before leaving for info. Although, after that I received everything I needed quickly. The staff was extremely polite and helpful. They were more than accommodating when I requested an extra night and late checkout.